I want to know what is going on with this matter. 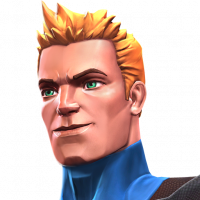 I haven’t heard anything from kabam on what happen and is going to be done. I dont care if there was a whole month to complete it, everyone’s life is different. Some people have more time then others, some have kids some don’t, some work a job or 2 some don't, some go to school some don’t, some just have a life some don’t. No matter what it is, everyone’s time is different and we shouldn’t be talking about how long you had to complete the event. This is about we had until a specific time with our symbiote to finish the quest, plus thats why the quest was made in the first place to be completed with a LEVELED UP symbiote not a NERF symbiote. So all i care is for a solution to this matter. I finally had SOME TIME to finish the quest on November 7, 2018 and started wasting resources and energy going back to the lower levels just to get more of the klyntar shards to finish the symbiote mode only to be cut the TIME THAT WAS GIVEN BY KABAM to complete the quest. WTH is all that about? I would of easily finish my three lines i had left in 20mins given the all the boosts you can use, fights were done super quick with the symbiote. I lost time and resources on something we had no control of or no one expected. So i would like my 5-star feature because i know we not getting the 20 mins back. @Kabam Lyra just wondering how this helps those who were working to get back into the Symbiote difficulty. I was trying to get 100% on Master to get the Klyntar Strands necessary to finish, and had 2 or 3 fights left. Also, it seems like 3 Occult Lab crystals is poor compensation for missing out on a featured 5* crystal. 3 days. And all we have is silence. This isnt a proper community support or customer support. They responded. If you were in a Blood and Venom Quest when he was taken down, you will receive 3 Tier 5 Occult Lab Crystals. Nonsense... This is not your gift, it's something we've won. Because you broke the rules, we can't get our reward.please fix this, we want the events reward, nothing more. This is so sad... I have attached video on YouTube and screenshots. I paid 22€ to buy units just for energy to finish on time and get my 5 star featured crystal, and I was only one run away from it when symbiote got nerfed. 3 crystals with a remote minimum possibility to get a 5 star? I want 100% possibility to have the 5 star fighter I purchased for, or my 20 minutes back to get it. Three Tier 5 occult lab crystal?? WTH you guys are kidding right. This is garbage. LOL, surely one couldn't have posted this with a straight face. Thanks for the update, some thoughts on this though. It appears you are saying the compensation will be give to anyone who was in any difficulty of the monthly quest? This doesn’t seem to address the primary concern here which is those who were close to finishing the difficulty designed for the symbiod that got nerfed early. It also sounds like this compensation will be given no matter where people were in the quest. This general compensation seems reasonable, however I think those who were close to finishing the symbiod difficulty should be addressed separately since the difficulty could only be completed using the symbiod. Just read before posting. Kabam said via message symbiote was ranking down at 10am that day, just when supermission have ended. But they nerfed symbiote at 09:30am aprox., while lots of people were finishing exploration. So it is not generous... Seriously. I almost had a featured five star crystal (only last walk pending) and now I am getting a pretty **** in comparison. Take also in consideration I paid 22€ to get units/energy to explore and was stopped by kabam just before ending. They're doing something at least. It's not reasonable to send everyone who was in the Quest a Featured Crystal. I won't spend any money in the future for this game... That was the last time. You’ve actually posted something I agree with for a change. But if Kabam can tell whether we were fighting in one of the Blood & Venom quests, they can see how close we were to finishing the Symbiote difficulty. Anyone with 2 or less paths left should have had more than enough time to finish if they hadn’t nerfed the Summoned Sym. They could easily enough award those of us in that category the rewards that we were rightly going to earn. I'm really not sure if this is being said seriously or sarcastically so I'm not gonna to respond as though it's one or the other lol but I'll just leave this here where their in game mail clearly states he'll be ranked down after the event ends. Anyone on their last run should be given the proper rewards and not this garbage generic compensation. Anyone who sees this, whether impacted by it or not, who thinks as a customer they're valued or respected here is naive as they come. The company made a mistake here and instead of making it right are slapping their customers in the face. 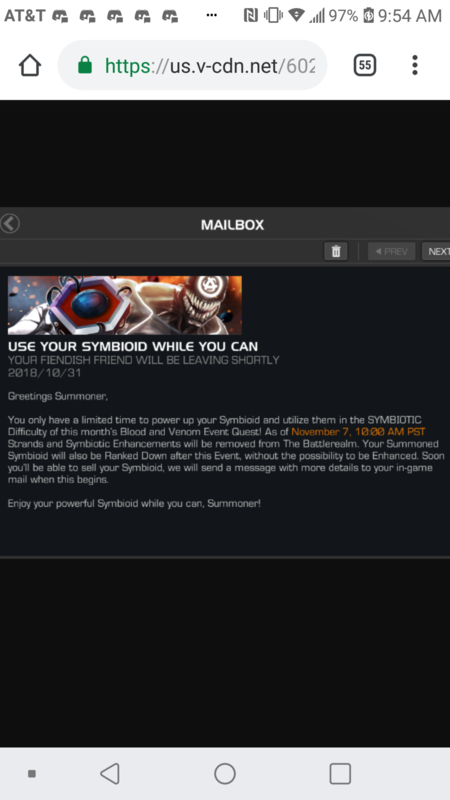 Actually they said "Your Summoned Symbiod will also be ranked down after the event has ended" in the screen shotted message that YOU posted above. I finished it a while ago, but I can understand OP's frustration as they clearly ranked him down before the event has ended. I might have come off as a bit insensitive, sure. I understand it's upsetting. I just don't think it's a good idea in general to wait so close to the last minute for things. Anything can happen.